Terrific news and really makes up for our narrow miss at the BAFTAs! We've won Best UK Short at this year's @Indie_Lincs Film Festival! Thank you so much! You can find out more about the festival here! Paris International Fantastic Film Festival! What a great name! The Blue Door team are honoured to have been selected for the PIFFF. We’ve made it to the finals for Best International Short too! We’re up against films starring the likes of Marisa Tomeï, Minnie Driver! You can find out more about the festival and all of its fantastic entries here! The Blue Door has had more success and we’re absolutely thrilled! We got silver in the Best International Short Film category at Toronto After Dark Film Festival! You can find out more about TADFF here! We’re quite shocked and thrilled to have won Best Short Film at the London City Film Awards. The craft and caliber of the other films included in the line up were pretty brilliant. We didn’t think we’d even have a look in. Thank you so much London City Film Awards! This is brilliant! Thanks to much TITBFF! You can find out more about the festival and all its award winners here! This one is for our fantastic Production Designer Lynn McFarlane! Some of you may not know that The Blue Door set was entirely recycled; designed and constructed by Dresd. Lynn (Duncan and team) did an amazing job building, dressing, essentially bringing to life The Blue Door using entirely reclaimed supplies. She's as talented and green fingered as they come and as a result, she's been nominated for Best Production Design at Underwire Festival. Underwire is a Bafta recognised festival and you can find out more here: http://www.underwirefestival.com/events/she-wants-revenge/ Well done Lynn and good luck! We’re so humbled to have The Blue Door selected for this prestigious London Festival! We’re so pleased! 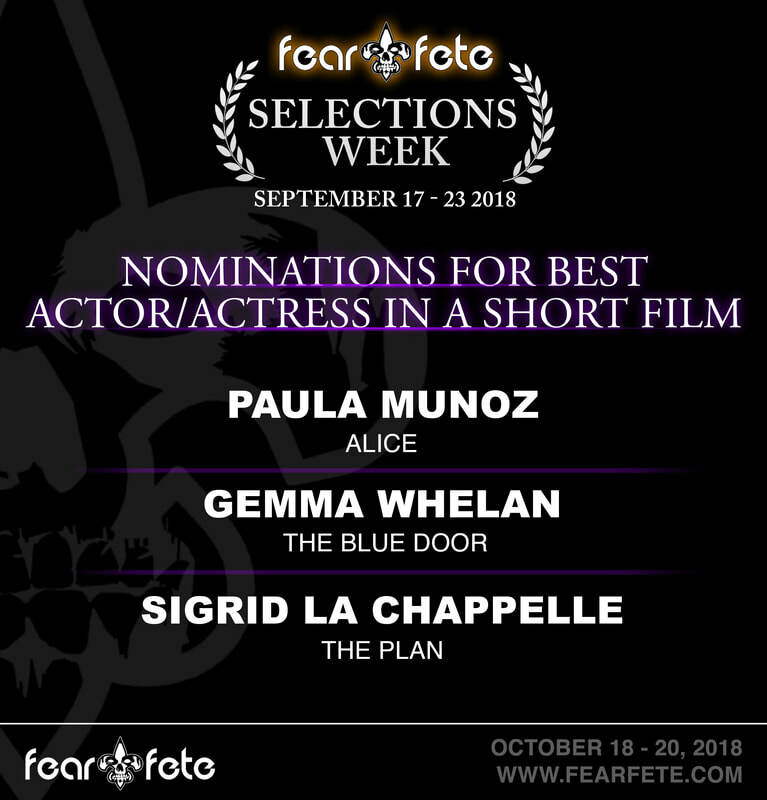 Not only did the brilliant Fear Fete Film Festival in Mississippi select The Blue Door for its programme, its been nominated for Best Director and Best Actor! Well done Paul Taylor and Gemma Whelan respectively! Hosted in Gulfport Mississippi, Fear Fete Film Festival has won countless awards, for its dedication to showcasing the best of the horror genre as well as being a terrific place to show case films for feature lengths and shorts alike. We're so happy The Blue Door has been selected for SMSFF - Screening all the way over in New Zealand! An Oscar Qualifying Festival! Show Me Shorts is Aotearoa New Zealand’s leading international short film festival, a competitive Academy Awards-accredited festival that screens in cinemas nationwide each Spring. Everyone involved is passionate about short films, story telling, the arts and culture in general. The Show Me Shorts mission: to create and cultivate the infrastructure required to achieve the widest possible appreciation of short films in New Zealand, and New Zealand short films internationally. The Show Me Shorts Vision: a future where the important role of short films in New Zealand culture is widely acknowledged and celebrated. To achieve this vision SMSFF work to connect New Zealanders with the best short films locally and around the world; celebrate excellence in short film making; and foster the New Zealand short film community. You can find out more about SMSFF here. Following our screening of The Blue Door at the FrightFest Short Film Showcase. We received a lovely review from London Horror Comic. Our first review for The Blue Door and they were very kind. Thank you London Horror Comic! We're so happy The Blue Door has been selected for a second BAFTA recognised festival! We're absolutely delighted that The Blue Door has been selected for Aesthetica Short Film Festival 2018! The Aesthetica Short Film Festival, founded in 2011, is an international film festival which takes place annually in York, UK, at the beginning of November. It is a celebration of independent film from around the world, and an outlet for supporting and championing filmmaking. The festival is a BAFTA recognised short film festival. You can find out more about ASFF and its screenings here! THE BLUE DOOR RECEIVES A SPECIAL MENTION AWARD AT LE PETIT CANNES! Whilst this was a small event in its first year, The Blue Door has received a Special Mention Award, following becoming a finalist at the Le Petit Cannes Festival in May. LE PETIT CANNES is a celebration of small films with big talent. Running parallel to the 71 Festival de Cannes, and hosted by legendary movie industry hangout LE PETIT MAJESTIC, they present the best in short cinema as chosen by an experienced and revered festival jury. You can find out more about Le Petit Cannes here! THANK YOU LE PETIT CANNES! The Blue Door will be screened on Sunday 6th May, 7:15pm at the Powys Room, Owain Glyndwr Centre. The Blue Door, has been chosen as the winner in the overall Best Short Film category of the Hollywood Just4Shorts Competition! With the win, The Blue Door will be promoted to the festival's Hollywood contacts who will consider our work for representation or adaptation deals. Additionally, each film entered into a genre-specific category will be eligible for a Hollywood Just4Shorts official award, honoring outstanding and original storytelling within the project's genre. You can find out more about Just4Shorts here! The Blue Door will be shown on Saturday 28th April, 8pm at the Columbus Theatre. The Blue Door has been selected for The Cryptshow Festival in Barcelona, Spain! The Cryptshow is a festival of horror, fantasy and science fiction, with the aim to claim the artistic and cultural values of the genre; to promote and support new artists; bring to light the work of authors who have been forgotten by the press and industry and shake cultural activity in the metropolitan area of Barcelona! You can find out more about the festival and all its screenings here!